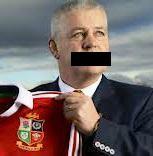 TOTAL FLANKER...a rugby blog: Spygate? Warren Gatland has apparently confirmed that he took England defence coach defence coach Andy Farrell on the Lions tour (ahead of Wales' Shaun Edwards) partly in order to get insight into how England prepare, especially with the 2015 Rugby World Cup in mind. A throwaway line in an interview? Maybe, but it again reinforces the feeling I had in the summer (dismissed by many as sour grapes) that Gatland had an agenda that was as much about preparing Wales for 2015 as it was about winning the series against Australia. It works both ways. Andy Farrell arguably got more out of seeing Gatland's full setup rather than just one individual coach.